We hope everyone had a wonderful holiday. 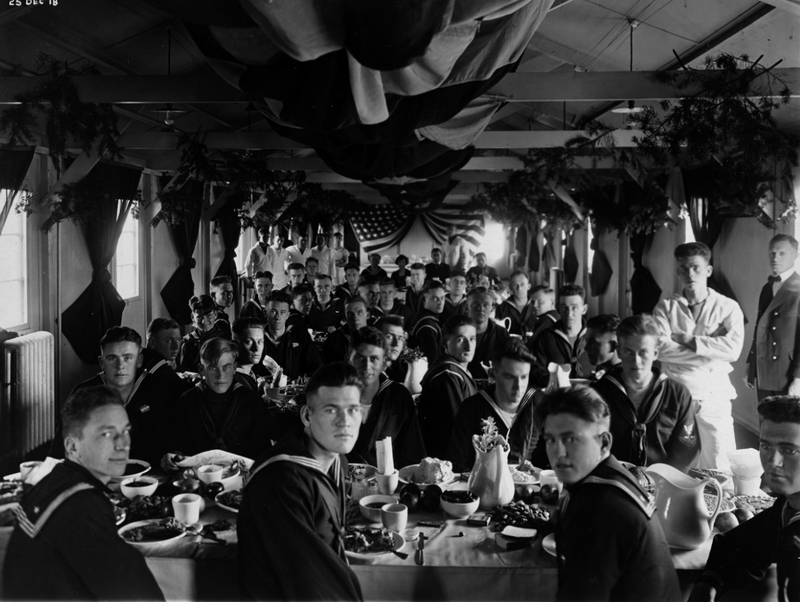 Now that we are full of ham, lasagna, fish or whatever your family has as a traditional Christmas meal, lets take a look at how the Navy has celebrated Christmas dinner over the years. In the Navy, the period between Christmas and New Year can be a poignant, introspective time, particularly during deployments and operations far from homeport and family. Recognizing this, the service has always strived to emphasize the joyous side of the holidays, not least through dinners that have drawn on everything that storerooms, reefers, and local markets have had to offer. A sampling of command menus from NHHC’s collections from the 1910s through the 1950s, from the mess spaces and wardrooms of the aging coastal monitor to those of the Cold War destroyer, follows. USS Monterey (Monitor No. 6). 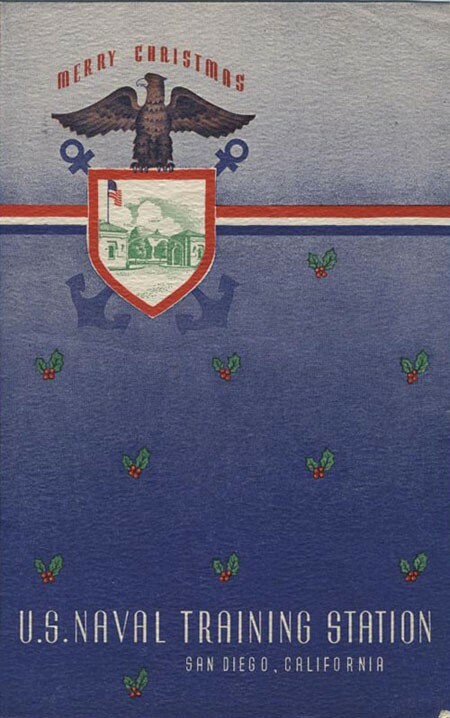 In service since 1893, Monterey was serving as a station ship at the Pearl Harbor, Hawaii, submarine base in 1918. Her crew was offered a choice of three entrees, including local red snapper. USS Isabel (SP-521). 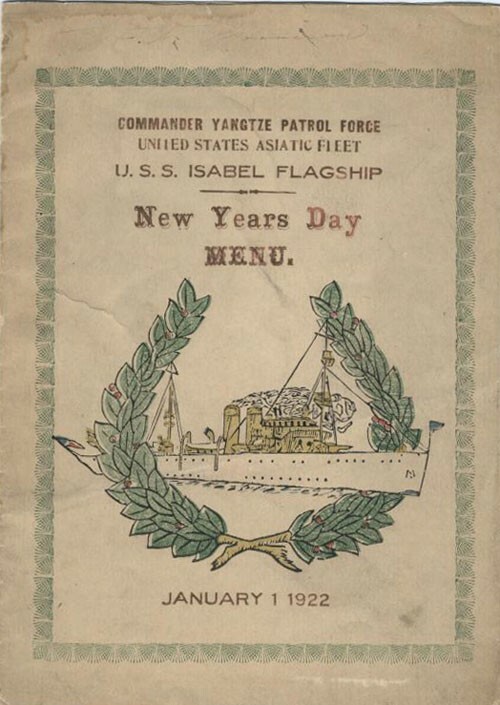 As flagship of the U.S. Navy Yangtze Patrol Force, Isabel’s New Year’s Day menu fittingly included roast Chinese duck. 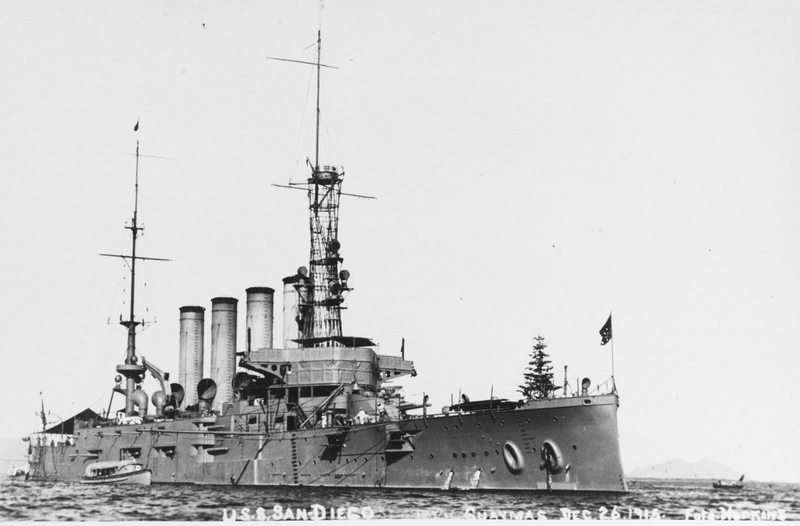 USS San Diego (Armored Cruiser No. 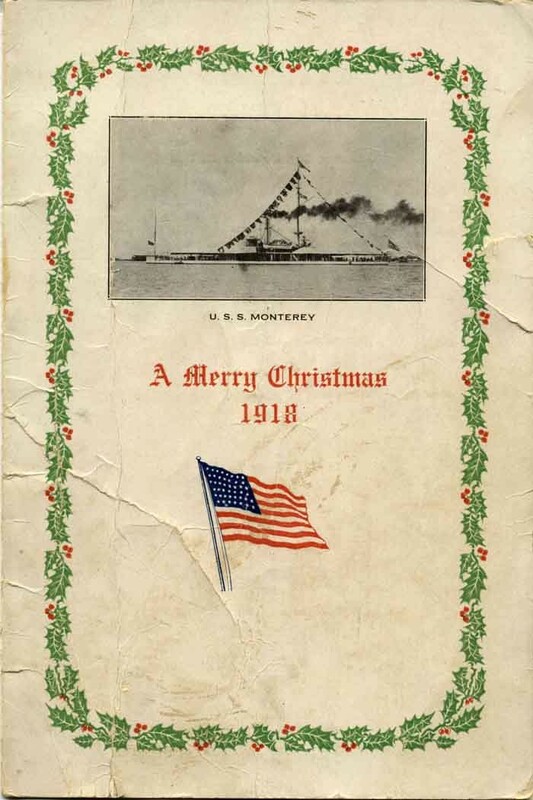 6) off Guaymas, Mexico, 26 December 1915. 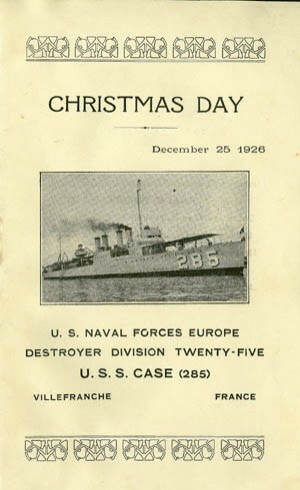 Note Christmas tree mounted on her forecastle (NH 92174). USS Case (DD-285). Villefranche, on the French Riviera, was a regular port call for Navy ships during the 1920s and 1930s. However, Case’s Christmas Day menu is solidly American. USS Colorado (BB-45). 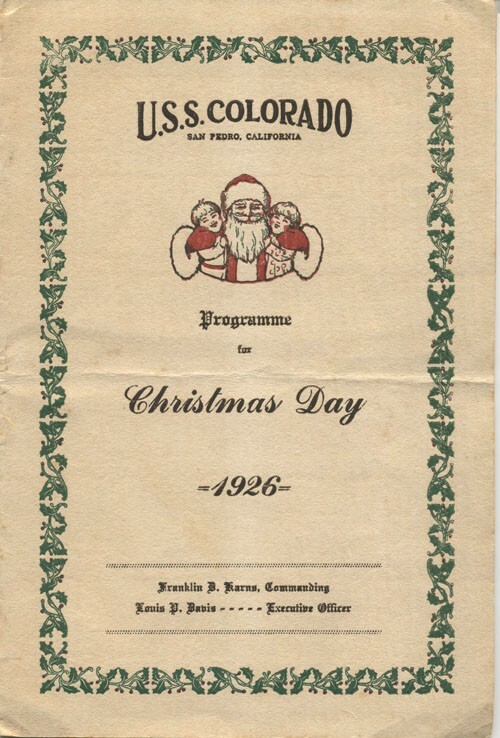 On Christmas Day, 1926, Colorado was in port San Pedro (Los Angeles), California. 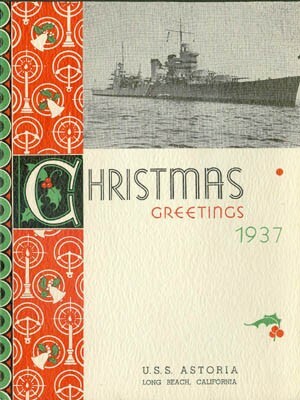 Christmas card of 1930s vintage from future CNO Admiral Arleigh A. Burke and Mrs. Burke, featuring depictions of then-Lieutenant Burke at the camera, Mrs. Burke with accordion, and their great dane dog. 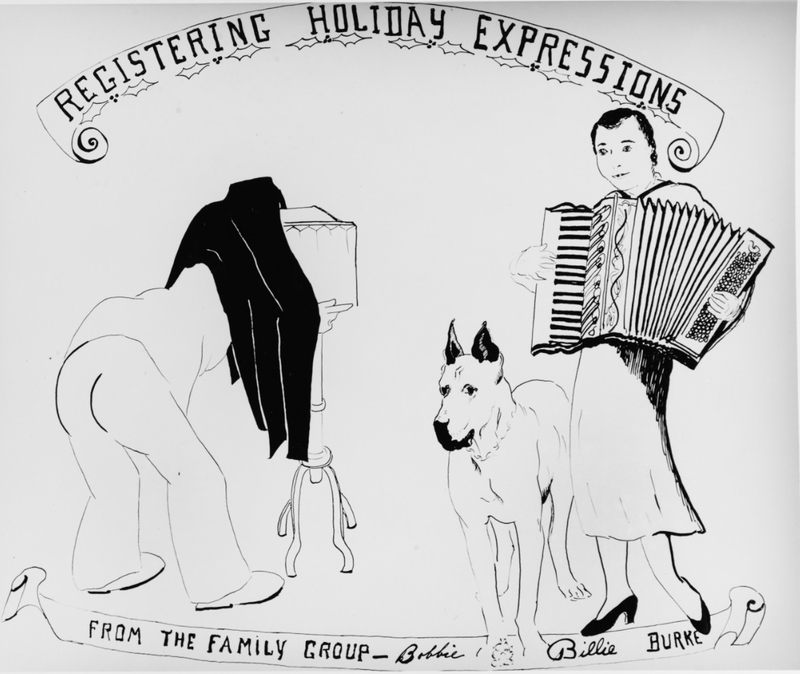 The card was drawn by Mrs. Burke (NH 83973). USS Raleigh (CL-7). 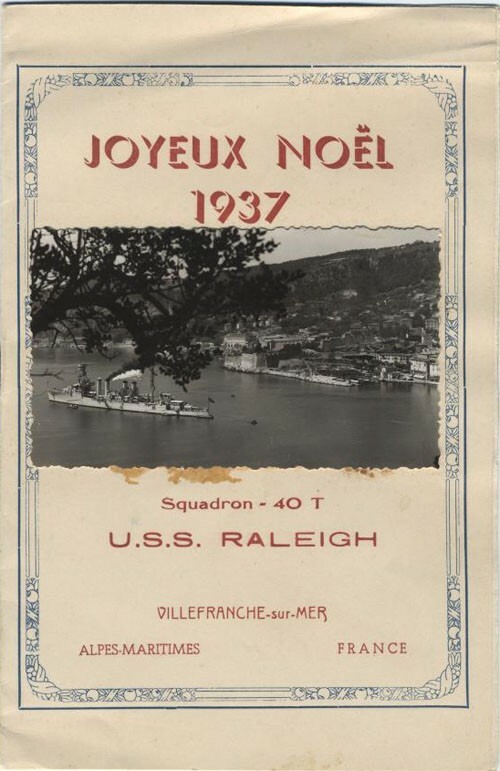 Another Villefranche port call: In contrast to USS Case above, Raleigh couched her entire dinner in French. USS Oklahoma (BB-37). 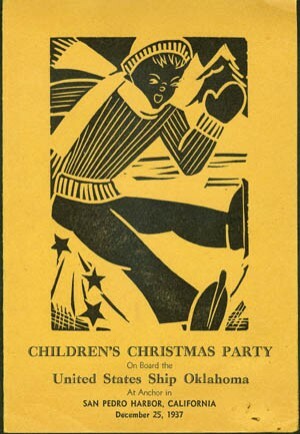 The children’s Christmas party was an early community relations event—an all-day affair that included two church services, baptisms, caroling, puppet shows, and a midday feast. USS Bridge (AF-1). Commissioned in 1917, Bridge spent most of her active service before and during World War II in the Pacific. 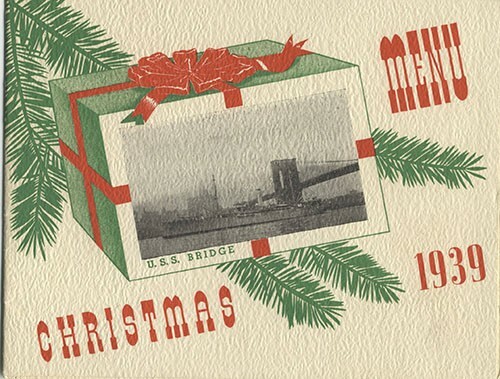 However, the inadvertent pun in this image of Bridge and the Brooklyn Bridge, from the ship’s tour in the Atlantic during the 1920s, was likely too good to resist using on a holiday menu. USS Mississippi (BB-41). 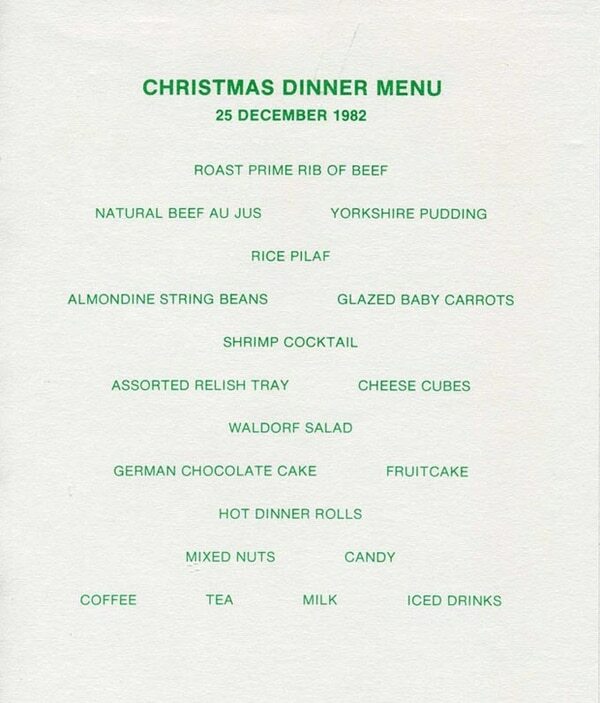 Although home-ported in San Pedro, California at the time, Mississippi spent Christmas 1940 in Hawaii, where this expansive dinner was served. 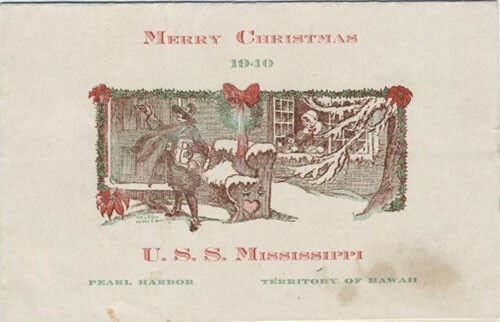 When the Japanese attacked Pearl Harbor a year later, Mississippi was on patrol service in the North Atlantic. USS Astoria (CA-34). Commissioned four years previously, Astoria was a “treaty cruiser,” constructed under the limitations of the London Naval Treaty. She was lost at the Battle of Savo Island on 9 August 1942. USS Cushing (DD-376). 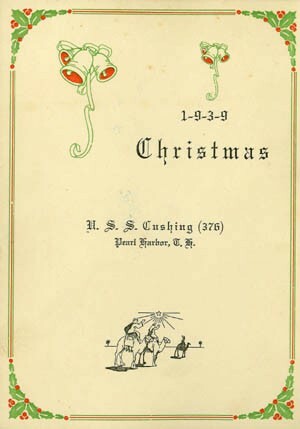 Despite being home-ported in exotic Pearl Harbor in 1939, Cushing’s Christmas dinner was as unremarkable as its menu card. 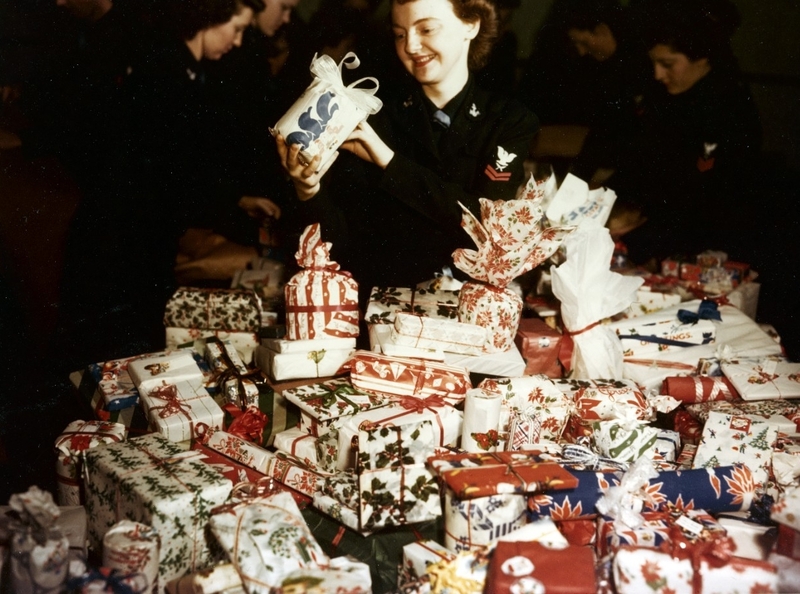 WAVES of the Bureau of Supplies and Accounts help wrap Christmas presents for Navy and Marine Corps convalescents at the Bethesda Naval Hospital, Maryland, circa 1944. Admiring a package is Yeoman Second Class Ann G. Fee (80-G-K-14451). 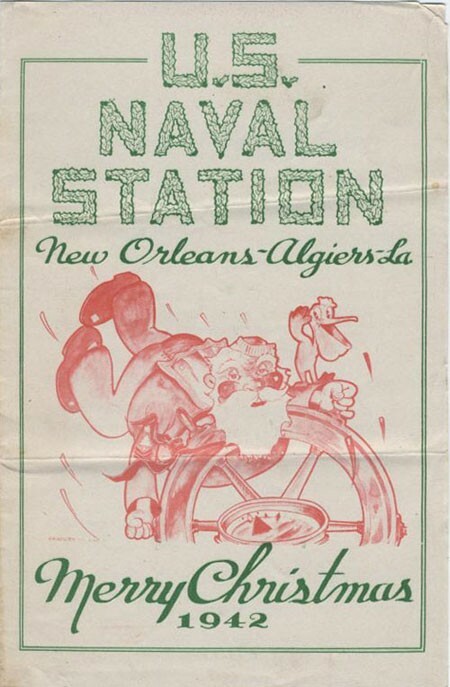 Naval Station New Orleans, Algiers, Louisiana. Despite being printed and mimeographed on base, creative talent is still apparent on this menu. Note that the two senior enlisted commissary billets are actually filled by retired chief petty officers. U.S. Naval Training Station, San Diego, California. 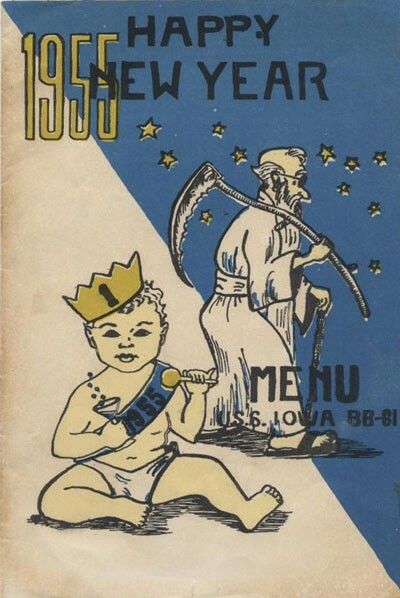 The station’s commanding officer added an encouraging note to this 1943 menu. Although World War II’s duration was still uncertain, its outcome was no longer in doubt. 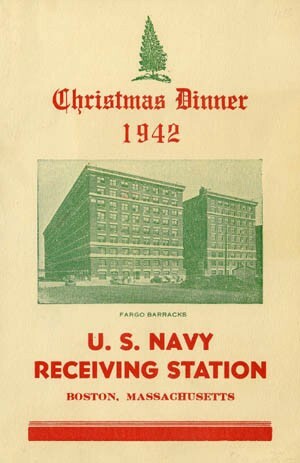 U.S. Navy Receiving Station, Boston, Massachusetts. Countering the intimidating facade of the receiving station barracks, the command’s chief commissary steward organized a veritable feast for the new Sailors being processed here. USS Santa Fe (CL-60). 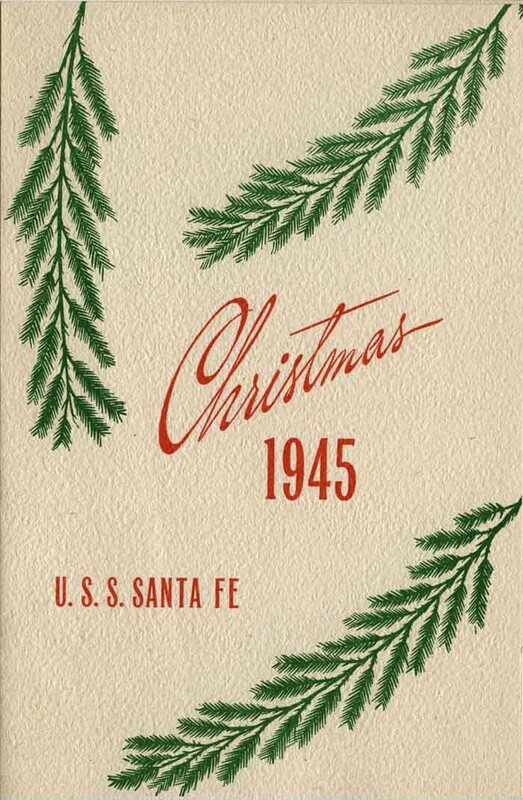 At the time of the first peacetime Christmas in six years, Santa Fe was engaged in “Magic Carpet” operations, ferrying servicemembers from Pacific bases to the U.S. west coast to be discharged. 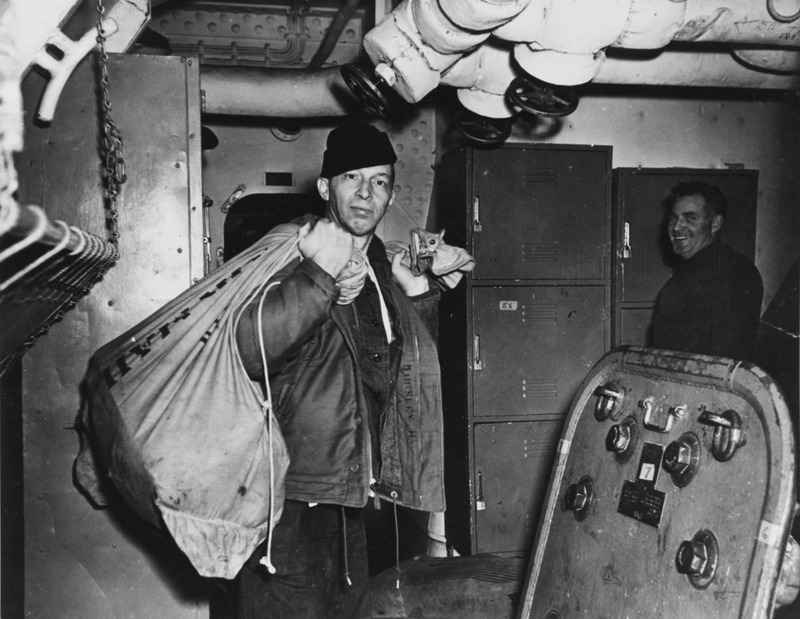 Teleman First Class Howard Bursley, USNR, carries bags of Christmas mail received onboard USS Missouri (BB-63) during operations off the Korean coast, 18 December 1950 (80-G-424639). USS Iowa (BB-61). In January 1955, Iowa was still flagship of Commander, Battleship-Cruiser Force, U.S. Atlantic Fleet, but was to detach shortly for an extended Mediterranean cruise with Sixth Fleet. This menu was produced in the ship’s print shop. USS Barry (DD-933). 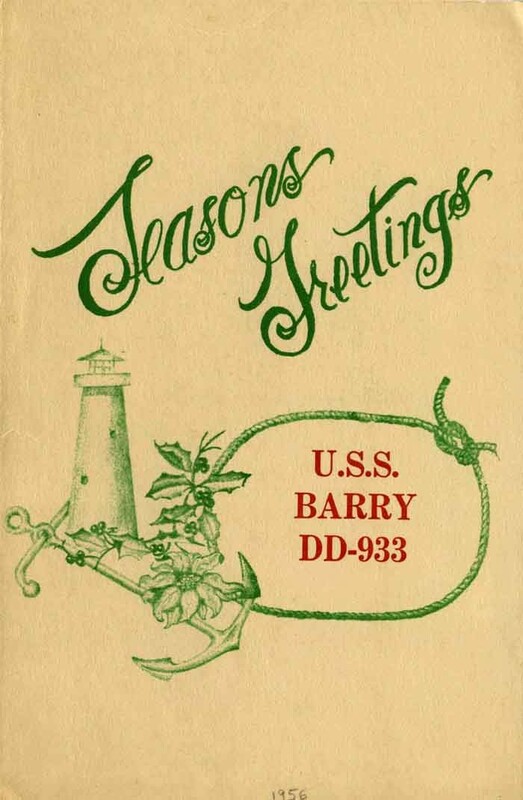 Barry was commissioned in September 1956, three months before this holiday dinner. At the time it was being served and prepared, the ship was still being fitted out at Boston Naval Shipyard. Nonetheless, the meal was extensive and included a challenge to most cooks: enough Yorkshire pudding for the entire crew. The Year: 1917, about eight months after the United States entered World War I. The Ship: The “Bulldog of the Navy” Oregon, a pre-dreadnought, Indiana-class battleship commissioned in 1896. Old school. 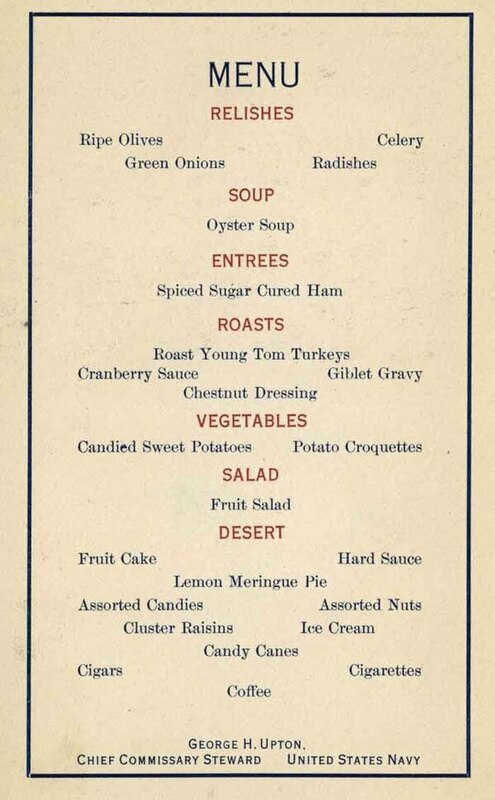 Menu – Relishes: Ripe olives, Celery, Green onions, Radishes; Soup: Oyster soup; Entrees: Spiced sugar cured ham; Roasts: Roast young Tom turkeys, Cranberry sauce, Giblet gravy, Chestnut dressing; Vegetables: Candied sweet potatoes, Poatato croquettes; Salad: Fruit salad; Des[s]ert: Fruit cake, Hard sauce, Lemon meringue pie, Assorted candies, Assorted nuts, Cluster raisins, Ice cream, Candy canes; Cigars, Cigarettes, Coffee – George H. Upton, Chief Commissary Stweard, United States Navy. The Ship: 1941-The humble Bridge, the lead storeship (AF-1!) of her class, serving proudly through World War I and World War II. 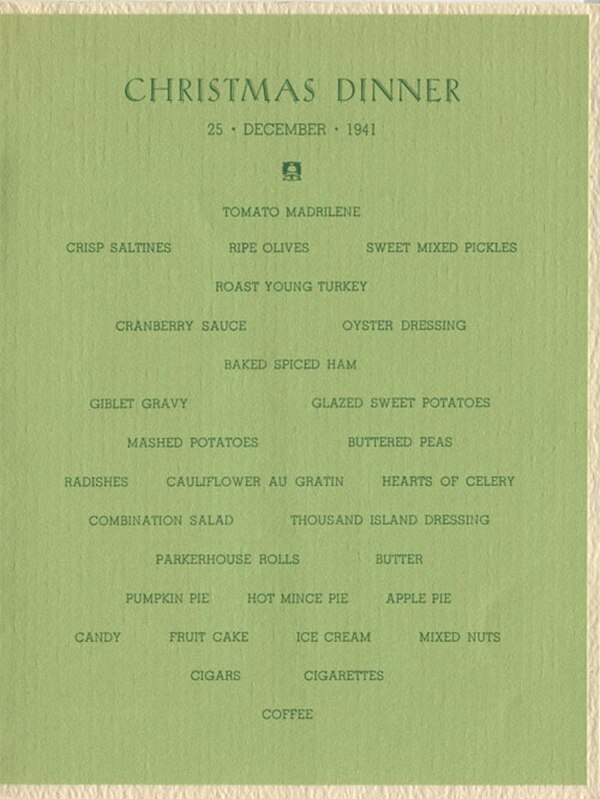 Christmas Dinner 25 December 1941: Tomato Madrilene, Crisp Saltines, Ripe Olives, Sweet Mixed Pickles, Roast Young Turkey, Cranberry Sauce, Oyster Dressing, Baked Spiced Ham, Giblet Gravy, Glazed Sweet Potatoes, Mashed Potatoes, Buttered Peas, Radishes, Cauliflower Au Gratin, Hearts of Celery, Combination Salad, Thousand Island Dressing, Parkerhouse Rolls, Butter, Pumpkin Pie, Hot Mince Pie, Apple Pie, Candy, Fruit Cake, Ice Cream, Mixed Nuts, Cigars, Cigarettes, Coffee.